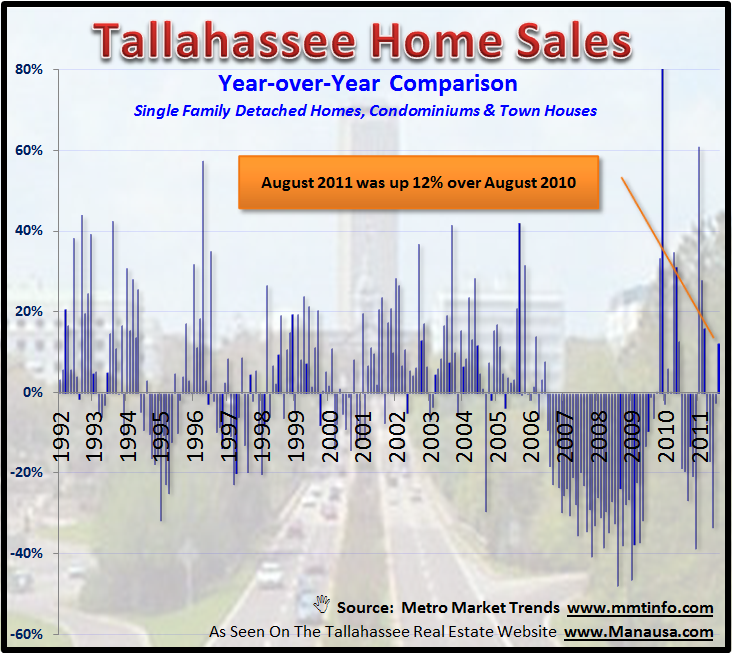 Recently released data on home sales in August show that the Tallahassee real estate market had its first increase over same month sales since March. Tallahassee home sales grew by 12% in August versus August 2010, and this is very good news for a market that has been on the decline for quite some time. 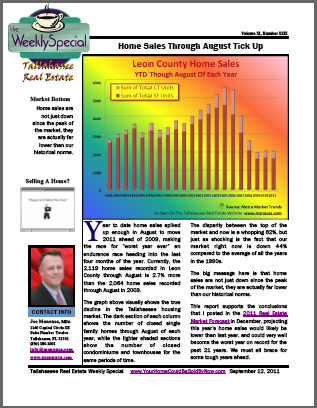 Reminder: The Tallahassee Real Estate Newsletter (Weekly Special Report) was published and sent to subscribers this morning. You can subscribe to the newsletter for free and receive regular updates delivered right to your email inbox. Click Here To Subscribe! Year over year home sales reports show directional changes in the housing market, and we have observed far too many months of declining home sales. In fact, we saw an unprecedented streak of 39 consecutive months of declines from July 2006 through September 2009, as our housing market came down from the real estate boom of years prior. In the real estate graph above, the blue vertical lines show how each month of the past 20 years performed when compared to the same month one year prior. If the line is above zero, then the month had more home sales than the corresponding month of the prior year, while the opposite is true if the line is below zero. There will be no immediate cure for home sales in Tallahassee (and many other US housing markets) as home sellers find themselves in a position that prohibits them from selling their homes to buy another. Many homeowners in Tallahassee have lost the equity in their homes that would be used as the down-payment on their next homes, thus creating a "chicken versus the egg" problem in stimulating a higher rate of home sales. Considering that more than half of our historical buying pool comes from people who must first sell a home, the housing market has fallen into a trap that only time will cure. We must rely on household formations to produce new homebuyers who will purchase homes through short sales, foreclosures, bank owned properties, and traditional methods and over time, we will see the balance restored between home buyers and sellers. If you are thinking about selling a home in Tallahassee, my advice is to make a decision to sell it fast or plan on waiting many years before you will be able to get a price that will be similar to today's home values. We have not yet found the bottom of the market as far as home values go, so time is of the essence for home sellers.